Run over to Ebento to get these fabulous mesh bodies with fully loaded HUDs. They will only be available today, February 14th. To receive Romeo join the eBento Lovers group, then pay 1L (it will be reimbursed). 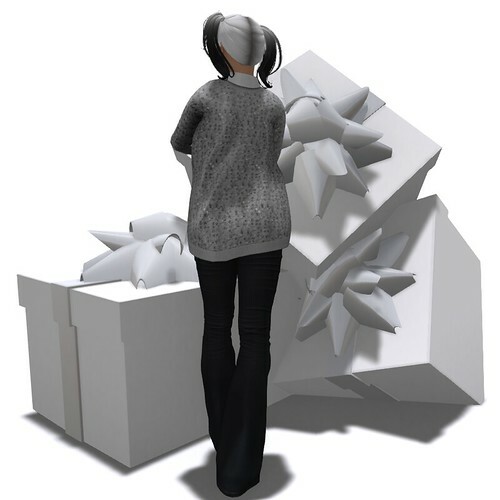 Juliet is free for Altamura group members. Joining Altamura’s group cost 50L. Folks it is totally worth joining this group! Juliet is gorgeous and fully functional. If you don’t have a mesh body this is your chance to get a great body that would normally cost close to 5,000 Lindens. I can’t say enough nice things about Altamura. Thanks guys from making our Valentine’s Day! It’s true, I’ll admit it. I’m just as crazy as the next girl ’bout a sharp dressed man! 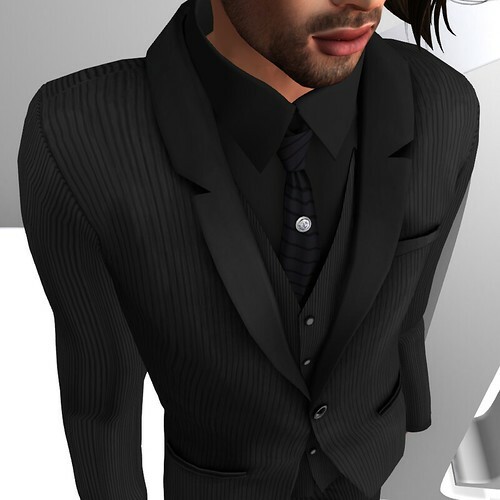 If you’re a male avatar that favors a slim legged shape then this suit is for you. 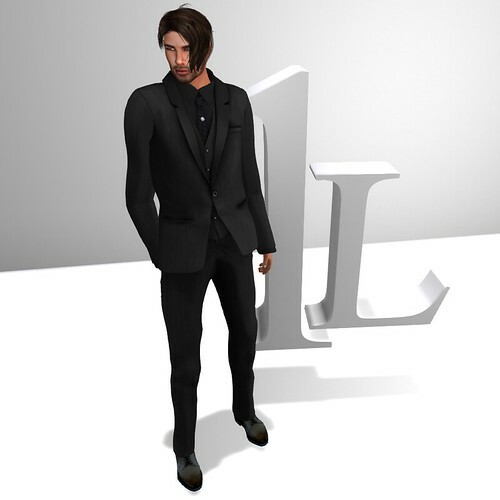 Of course if suits aren’t your thing, you’ll find lots of other great articles of clothing at Gabriel’s 1 Linden sale. 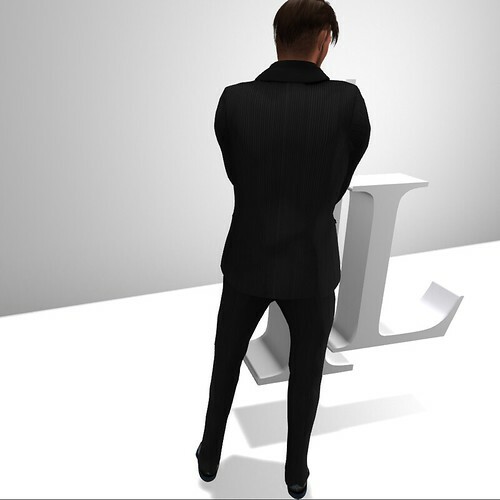 The suit comes in 4 sizes: XS, S, M, L/XL plus an alpha for classic avatars. Here’s a closer look at the detailing. 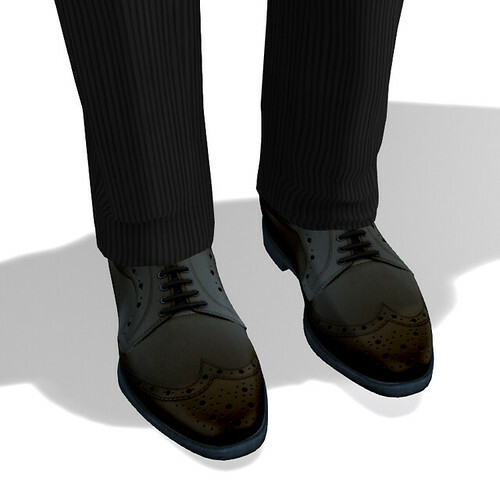 Our model popped over to the Ajuda Brasil Voluntarios sim and found these dress shoes. They come in brown, which really didn’t work with this suit. Luckily, they are modifiable, so Cabal added a light blue tint to turn them black allowing for the detailed lighting to remain. Keep us runnin’ guys! With over a hundred free gifts just waiting to be snatched up it’s no wonder I’m still shopping & hopping! The Shop & Hop event definitely requires more than one visit to gather all the fantastic gifts offered. To add this tastefully sequined gray sweater to your wardrobe you’ll have to pry yourself away from Shop & Hop, and teleport to Hilly Haalan. Join the store’s free group, then saunter over to the gift room to pick up this beauty. It comes in black and gray, and can be worn by both classic and mesh avatars. It adds just enough sparkle to keep the festive flow of the holidays twinkling though to the New Year. This lovely lady is my favorite Altamura gift body to date. Clodet’s mostly oval jawline coupled with ultra glamorous eyelashes and the subtlest icy pink lips are simply stunning! 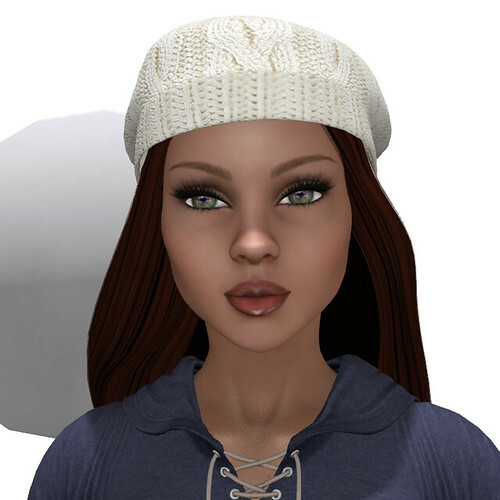 If you favor a light sallow skin color, Clodet is more than worth the 10 Linden group join fee for the TeleportHub. Cubic Cherry’s Nemune mesh eyes look great on Clodet. Nemune eyes come in 8 shades plus they have additional shadows and Omega applier HUDs. Fans of pigtail hairstyles will love this fatpack from bonbon. The style comes with an additional candy bow HUD (not pictured) that allows the wearer to show or hide the ribbons. Until next time, shop happy! Shop & Hop Your Heart Out! With so many wonderful free events going on across the grid it’s easy to miss out on a load of excellent goodies. I’ve been so focused on checking out advent calendars I almost missed a giant winter shopping event organized by the Lindens. And, as you may have guessed, each store has set out one completely free (no group join required) gift. Shop & Hop runs through January 4, 2019. So, gather your shopping bags together and shop happy! Here’s a closeup of a few of the Shop & Hop jewelry gifts and the gift from Vanity Hair. Though it will cost you 25 Lindens to join the group, this is Altamura’s Leila (12 Days of Chrismas) group gift. She is quite lovely as is (pictured above), however she’s also Omega compatible. A quick visit to Omega Solutions to purchase the Omega Applier HUD for 99 Lindens will leave you with lovely bento rigged mesh head that only cost 124 Lindens total. Leila, does not come with a HUD controller, but it’s not necessary. Altamura supplies an easy to follow notecard with links for free eyes and free applier clearing HUDs that make changing skins a snap. Above is a picture of Leila wearing applier skins from 7 Deadly Skins. I was a bit skeptical when I realized Leila didn’t come with a HUD interface of her own. But, after working with her for literally no more than 10 minutes, I realized a HUD simply isn’t necessary. And, in some ways it’s a lot easier adding your makeup without using a cumbersome HUD. Let’s finish off with a closeup of Momento’s Shop & Hop shoe gift. Happy Christmas Eve everyone. Enjoy!